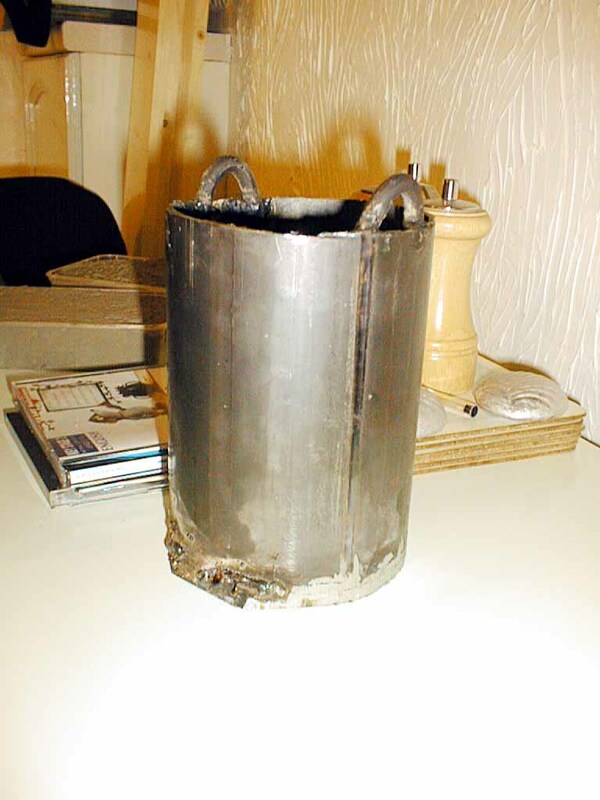 31-Jul-02: Shown on the left is the first attempt at a steel crucible, code named "Fat Boy". The material used is 5mm wall thickness pipe with 115mm OD. Height is 150mm, giving a total capacity of 1.3 litres, and a working capacity of 1.0 litres (about 6lbs of aluminium). 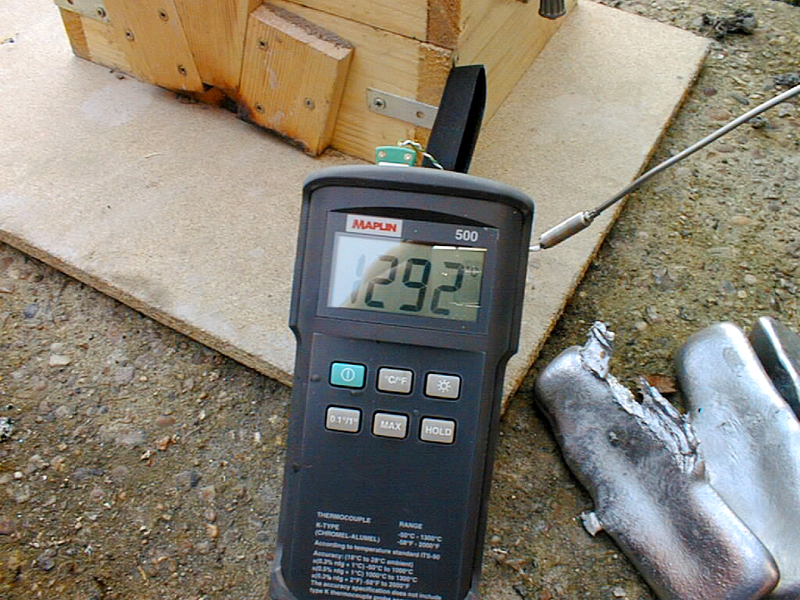 The welding failed the "water test", so there is no way I'm going to try and melt metal in it. All of the welding is being ground off, and will be done again. 1-Aug-02: After some grinding and re-welding, Fat Boy is operational. There's nothing like a good burnout at the end of the day. Picture shown is after a short pouring session, I think that Fat Boy could do with some lifters and a spout would stop the metal going all over the place. 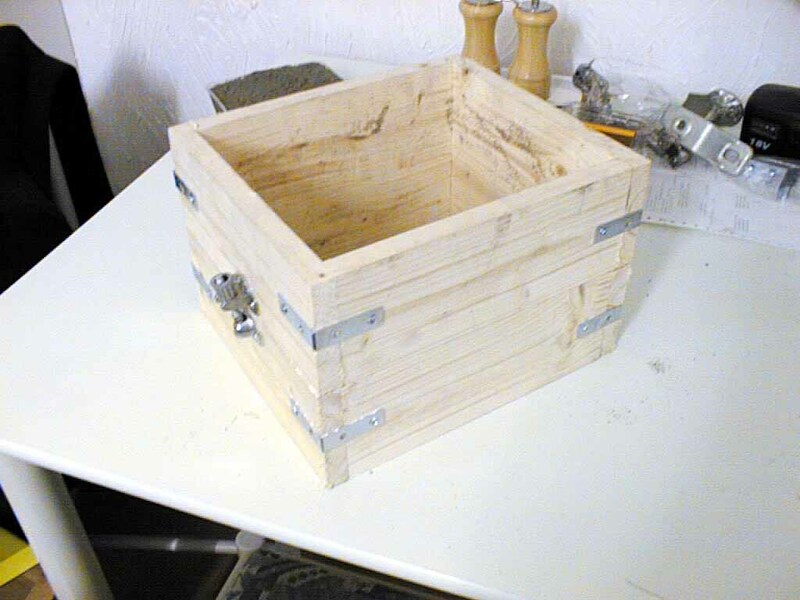 3-Aug-02: While in a welding and grinding frame of mind, an ingot tray was made up from 2" angle and some steel strip. Having just acquired 50kg of alloy car wheels from a local non-ferrous scrap dealer, the ingot tray is now an essential item. I got the idea for this one from Chipmakers site under the furnace accessories section, although the dimensions are a little different. There are six inverted "V" moulds made from 50mm/2" angle, each being 150mm/6" long. This is a handy size, as each mould will take approx 1lb of aluminium matching the 6lb capacity of the crucible. 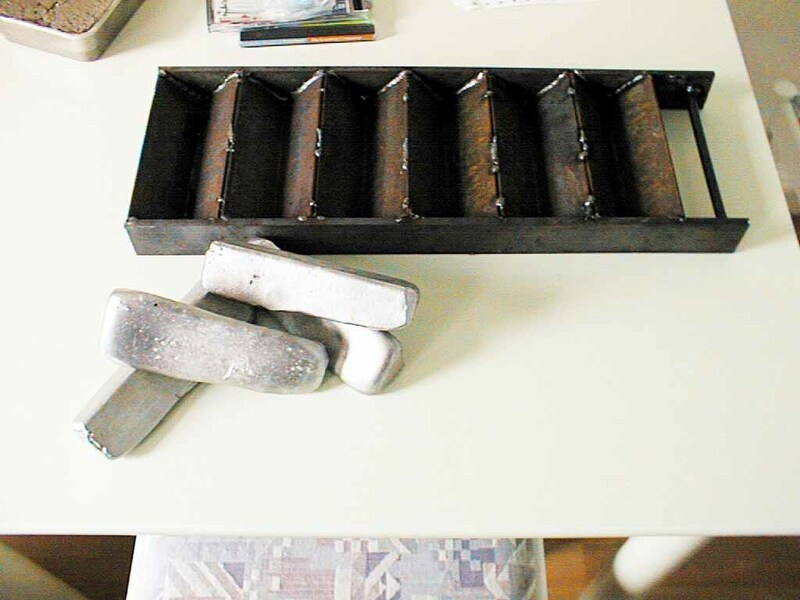 4-Aug-02: Ingot trays are all very good, but what I really need is some nice castings. A flask has been made up from spruce, a few mistakes with it (like no means of getting accurate alignment between the two halves), but it will do for now. The pieces are all 10" long by 3/4" thick. There are some window catches which hold the whole thing together. I did manage to do my first casting today, but it was a disaster. 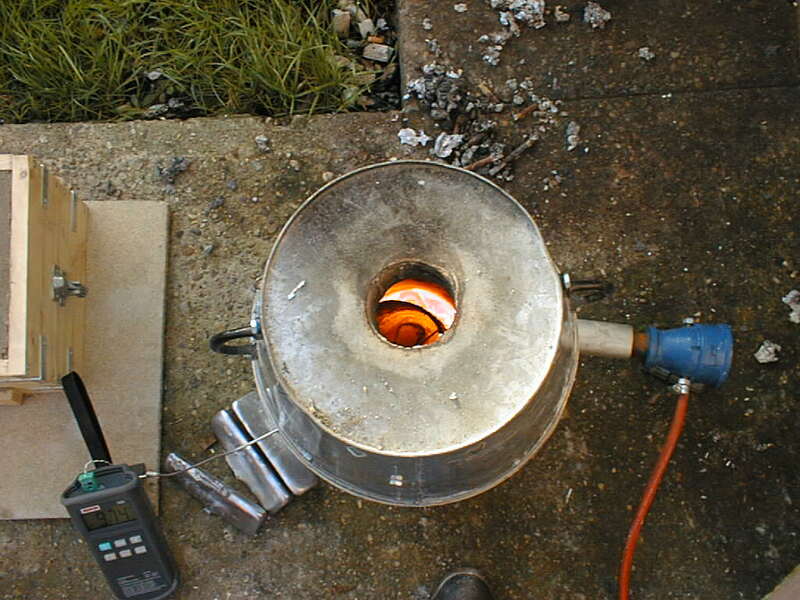 12-Oct-02: An attempt at casting clay crucibles, but this is not working out as planned. The welded tip is a little weedy, good for only 250�C/480�F although it has been dipped in the melt today at 710�C/1310�F pouring temperature. A 50cm inconel sheathed industrial thermocouple is on order from RS and should open up the full 1300�C capability. 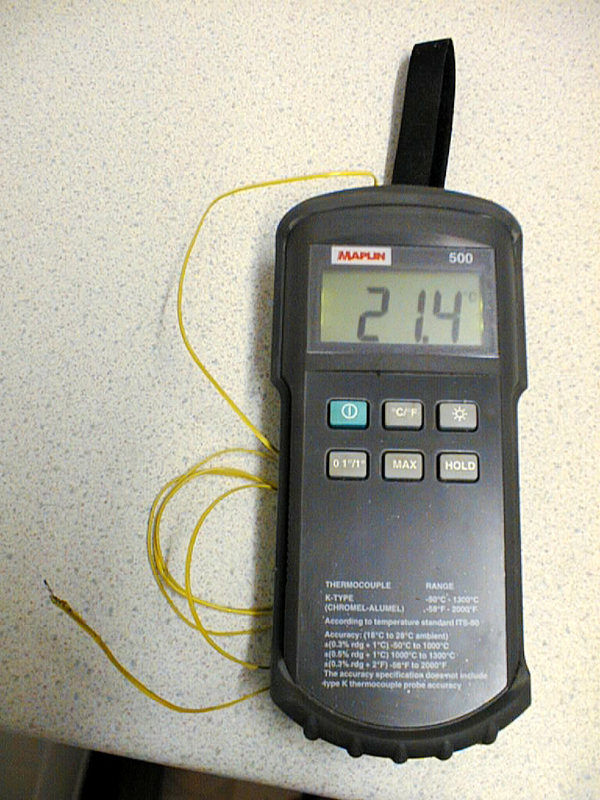 The new inconel thermocouple has arrived, so it's time to put it through its paces on a melting session. 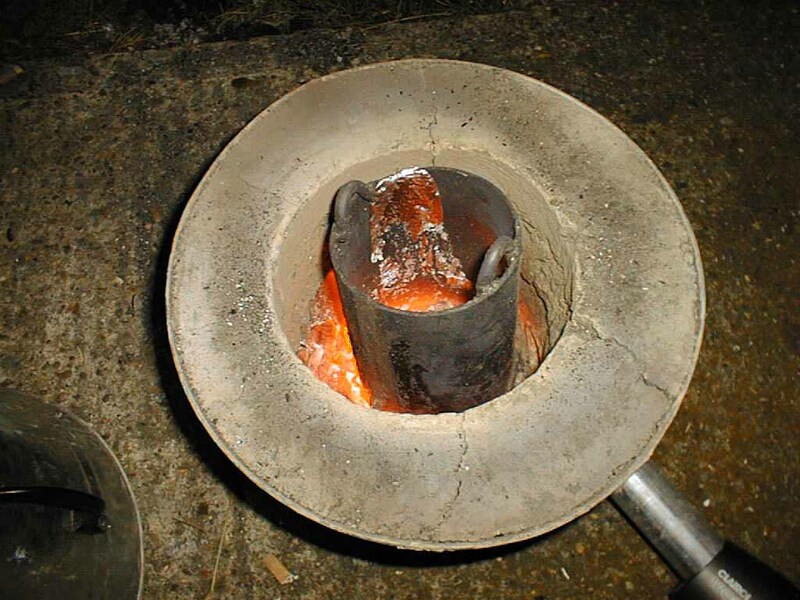 Here you can see the thermocouple going through the gap between the buckets, measuring the temperature of the inside of the crucible.